Begun as a hobby by a group of arboricultural professionals in 2000, Monkey-Do have facilitated treetop adventures for thousands of people over the years. The popularity of what we do led us to incorporate Monkey-Do as a not-for-profit Community Interest Company at the start of 2010, with the aim of taking our mission even further. All of the Monkey-Do crew double up as riggers and play supervisors, so everyone is CRB checked to work with children and trained in the installation of safety nets in trees. Our three company directors are also trained in outdoor paediatric first aid. 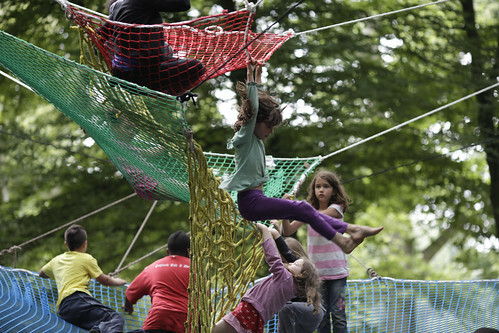 Most of our work involves running net play activities for events such as local authority play-days and children's areas at festivals, although we occasionally design and build more permanent play features too. We also provide training for play professionals, and can give guidance on installing structures or equipment in trees and associated tree protection measures. If you are considering booking Monkey-Do for your event, please download and read the information sheet below. Monkey-Do has an ethos that prioritises activities that encourage environmental and social benefits rather than commercial gain. These activities give young people the opportunity to play outdoors and in particular enjoy playing safely but with a degree of risk. Our work helps to engender greater understanding, enthusiasm, and respect for the natural environment in young people. Monkey-Do is not a commercial enterprise. As a not-for-profit organisation we only ask clients to cover the costs of carrying out work. We work to commission and our play installations at events are always free at the point of use, as we believe all children should have an equal chance to participate in this type of play. Monkey-Do is committed to liberating children from unnecessary strictures and fostering independence and self-determination. So in general we don't have much truck with rules. But there are a set of dos and don'ts we ask people to follow around the nets to keep everybody safe and having fun. You can watch Vic explaining these to a group of children in the video below. Monkey Dos and Don'ts from Monkey Do on Vimeo.